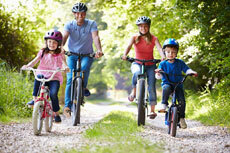 A family bike ride is a fantastic way to spend time together, be active and have a blast. To have a safe and successful day seeing the world from two wheels, it’s important to do a bit of planning and prep. These guidelines aren’t just for kids—be sure to set a good example and follow the tips yourself—including wearing a helmet and obeying traffic laws. And remember that bike rides don’t always go as planned. Try to be prepared ahead of time with snacks, water, diapers or other family essentials for those “just in case” situations. In the city, the safest place to ride is on the street, however, kids under age 10 might have trouble remembering the rules of the road, and the sidewalk might be safer for younger kids. When planning a city route, consider avoiding busy intersections, big hills and choosing streets with dedicated bike lanes. A bike path free of cars is a great choice for family rides—and there is no shortage of bike-friendly paths in Minnesota. The Minnesota DNR suggests planning a ride with kids on paved trails with a gentle grade—like you might find along an old railroad. Check out family-friendly bike trails in Minnesota and a list of paved trails around the state. Once your family has mastered the basics of biking, challenge yourselves by trying something a little different. Checking out the trail from the Bloomington Ferry parking lot heading east to the I-35W bridge because it is flat and full of fun stops like bridges, ruins and a Huck Finn barge crossing. Lebanon Hills in Eagan as a good spot for kids to get acquainted with mountain biking. Make this the year you keep biking through all the seasons. Get tips for winter biking with kids.